Home - Blog - Specials - Perfectly Personalized for Mother’s Day and More! Perfectly Personalized for Mother’s Day and More! Did you know that you can personalize any Annalee doll to make it a truly one-of-kind gift for someone special? You can select hand-painted wooden birthday numbers, choose a specific hair color or mouse jersey, or personalize a base with your heartfelt message. Annalee has got you covered with plenty of ways to personalize your timeless keepsakes. Just in time for Mother’s Day, we’ve upgraded our crafting studio with a new embroidery machine. Why not give Mom a gift she will cherish for years to come and shop our Mother’s Day Collection for the perfect Mother’s Day gift. Our team of craftspeople can customize your Mother’s Day message. Check out a few of our favorites! Personalizing your doll is easy! Choose the doll and then select the color felt for the base and add your own message. We offer 9 different coordinating felt-colored bases. You can include up to 2 lines of text with a maximum of 33 characters (Line 1: 18 character maximum | Line 2: 15 character maximum). Commemorate a special occasion and have the date or any message added to the doll’s base. Say “We Love You Mom” in style this Mother’s Day! If you are in the shop this service usually take about 30 minutes and you can watch the designer make the base or come back later and pick it up. Caution! Our mice are known to cause excessive smiling. 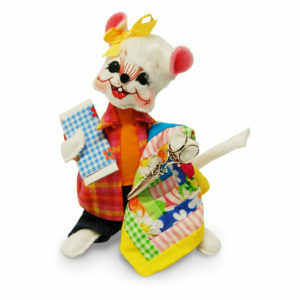 Whether you are shopping for a thank you for your favorite teacher or doctor or for an upcoming birthday, our mice make fun gifts for your friends or family. We’ve designed special mice to help you create keepsakes that celebrate hobbies and pastimes including the new athletes and scouts. These mice include a felt-colored base with your custom message. Celebrate life’s finest moments with unique heartfelt keepsakes from Annalee. Check out a few of our favorites!